Rural folks can beat the high prices of housing materials. Out of farm waster and ordinary soil, one can make durable hallow blocks comparable in strength to commercial ones. The hallow blocks can be made right on the building site and fashioned similar to commercial hallow blocks. Although considered strictly non-load bearing, it is very satisfactory for low cost housing. Its compressive strength ranges from 197 to 386 pounds per square inch (psi). This simple technology, developed by the Forest Product Research and Industries development Commission, makes use of a minimum amount of cement to make a stronger hallow block. One bag is enough to make 20 four-inch blocks or 12 six-inch blocks. The first step is to gather agri-wood waste such as sawdust, coconut trunk particles, sugar cane bagasse or ordinary soil. The latter has to be pulverized and sifted using a 1/4 inch wire mesh. Abaca waste, left after extracting fiber from the stalk, as well as coconut coir dust, the residue from processing coconut husk in coirflex plants, can also be used. Rice hull works too, but additional soil is needed when mixing this with the cement. Improvise hand mold to shape the hallow block. This can be made out of steel or wood of relatively high density such as apitong, guijo or yakal. 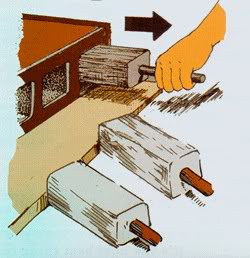 The mold should have three removable core blocks, and the sides should easily be opened and secured. Place hinges and lockpins as illustrated. Using the cubic foot measuring box, mix together one box of cement and three boxes of agriwaste, or the equivalent proportions. With the materials form a hill with a crater on the top. Pour water slowly, then, thoroughly mix them with shovel until the paste is formed. The mixture must be neither too dry or too wet such that they would stay packed when molded and when not spread out when removed from the mold. Place the flatboard at the bottom of the hand mold, then fill it with the mixture. Tamp and level off extra paste, then place another flatboard on the top. Turn the mold upside down, and tamp and level off as before. After a while, remove the three core blocks and the pin to let the sides open. Gently push the molded hallow block from the mold, leaving it in place on the flatboard. Place the hallow blocks in a shade for a few hours to dry. after one side has dried, turn the block upside down to dry the other side. Store these lock standing on their narrow edges. For about ten days, cure them by occasional sprinkling water over the blocks. Afterwards, they are ready for use. A new type of hollow blocks can be fabricated out of wood wastes, agricultural wastes and soil mixed with minimum amount of cement. As far as strength and durability are concerned, results of test showed that this type of blocks is comparable to some of the commercial or traditional concrete hollow blocks. However, they are considered as strictly non-loading bearing. Pulverized soil is passed through a wire screen, 1/4 inch wire mesh to separate larger pieces. A mixture of 1 part cement to 3 parts agri-waste is formulated. Mix all materials together, add water and pour into molds. Let stand for several hours until dry. After drying, remove from molds and let stand along one side for 10 days while sprinkling water at regular intervals to avoid cracking. I have a coconut lumber business and the sawdust left from cutting coconut lumber are wasted. I usually just throw it away if no one likes to make something from it. Can it be used to make hollow blocks?